In my first report from the Venice International Film Festival, I described the excitement of seeing three excellent and quite varied films right in a row, at consecutive early-morning press screenings: First Man, Roma, and The Ballad of Buster Scruggs. We had to wait a whole two days before seeing what may be the masterpiece of this year’s festival–this year’s Zama, as it were. 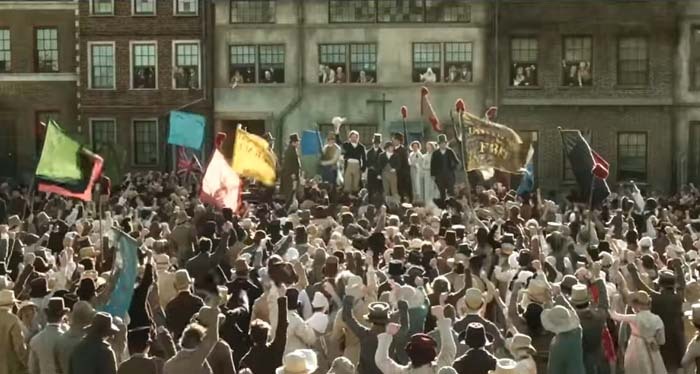 I’m sure virtually everyone who attended the press/industry screening of László Nemes’s Sunset was wondering whether it would live up to his first feature, Son of Saul (2015), which won, among other prizes, the Oscar for Best Foreign Language film. It’s one of the more deserving winners of that prize in recent memory. The narration famously concentrates fiercely on the central character, a Hungarian Jew forced to work in a death camp helping to kill and dispose of fellow Jews. 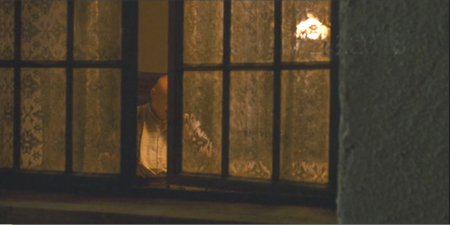 The camera follows him from behind or circles to show his face, and keeps most of the horrors occurring around him dimly visible, in the background and on the periphery of the shots, usually out of focus. Mark Kermode praised the technique as a brilliant solution to the problem of not showing those horrors but seeing them reflected in one man’s attention and expressions. We so much admired this rigorous technique that we incorporated Son of Saul into the new fourth edition of Film History: An Introduction. My suspicion is that many present at that first screening of Sunset in Venice were wondering if Nemes could do anything beyond similarly following a single character around, restricting our point of view in a dazzling exhibition of camera choreography centered on a single intense performance. Well, Sunset is based almost entirely on the camera following (below and top) or weaving around the central character, Írisz Leiter, or framing her face in medium close-ups and close-ups. There are a many of these “nape-of-the-neck” framings, as we might call them, with only Írisz in focus–and not always her. Again, the point of view is highly restricted to what she sees, hears, and knows. She is present in virtually every shot, or revealed to be nearby. 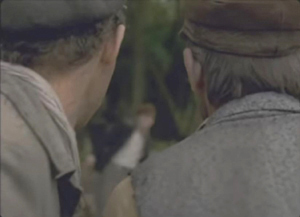 The apparent point of view shot into which the character steps is occasionally used in Hollywood and elsewhere, but here it becomes an insistent technique. I suspect further that, seeing virtually the same device being used again, reviewers dismissed Sunset as a far less original work than Son of Saul. It helped that the latter was a tale of the holocaust and fairly simple to follow. In my opinion, Nemes has done something extraordinary. He has taken the same basic approach but turned it to an entirely different use. Now the restricted point of view functions to slowly dole out clues in a complicated double mystery plot. The result is complex, tantalizing, and absorbing. Sunset is difficult to compare with other films or artworks, since it so very original. It is thoroughly modern art cinema. (Nemes worked as an assistant director to Béla Tarr, though neither of his features reflects any direct influence of Tarr.) It also, however, has something of the air of Feuillade serials. 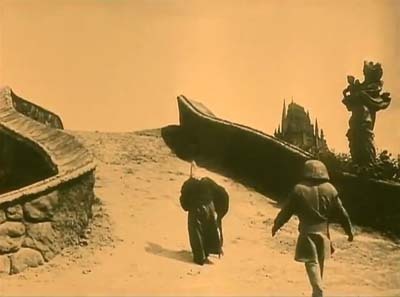 Fantômas was made in 1913, the same year in which Sunset‘s action takes place. Sunset deals with an anarchist gang, and at one point Írisz disguises herself as a man and escapes captivity through an upper-story window. There’s also a considerable streak of Grand Guignol (the theatre that was then building to its height of popularity between the two world wars), with actual and attempted rapes, rumors of a grisly murder, and torch-lit attacks by the anarchist gang. At least two reviewers have mentioned Mullholland Drive as a comparison point. I don’t think the two films have much in common, apart from their pleasantly puzzling aspects. It’s interesting, though, that reviewers grasped at such a comparison as a way of trying to convey the nature of a very unusual film. In fact, Nemes has said that Blue Velvet was one of his inspirations. That actually makes far more sense to me, with an innocent gradually witnessing unimaginable cruelties. The film depends heavily on our gradually getting clues and information as Írisz does, and to avoid spoilers I’m going to be vague describing the plot. The heroine is the daughter of two founders and owners of Leiter’s, a high-fashion hat shop in Budapest. Orphaned, she has learned hat-making in Trieste and returns to Budapest, aspiring to work in the shop and regain what little connection she can with her parents’ heritage. Her application for a job there opens the film, but she is turned down by the current owner of Leiter’s, Mr Brill. She soon learns that she apparently has a brother, hitherto unknown to her, who has committed a heinous murder five years earlier. While trying to track down the truth about him, she begins to suspect that Brill may be involved in equally hideous crimes. She spends most of the film wandering about looking for clues and trying to make sense of them. In fact there is nothing mysterious about either point. 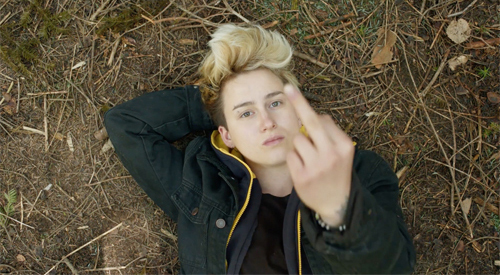 The film makes it quite clear that Írisz is not hired by Brill, even though she offers to work for free. She has no “regular work hours” because she has no job. Brill offers to let her sleep in the Leiters’ rundown house where the store’s milliners live, but he clearly is trying to control her attempts at investigating the dual mysteries. He assigns her tasks to keep her busy, but Zelma, the store’s manager and possibly Brill’s mistress, pointedly tells her when giving her a little task to do, “It doesn’t mean you’re hired.” Another task that he assigns her ends up having to be executed by the other milliners, as Írisz constantly defies Brill by leaving the store and dorm at every opportunity. When Leiter and Zelma tells her not to leave without permission, she inevitably and defiantly departs on another investigative foray. Brill’s description of her as stubborn is a considerable understatement. As for coaches, Írisz’s brother seems to control an anarchist gang consisting largely of coachmen, some of them with motives to drive Írisz to various destinations. Brill uses his coach to fetch her back to the store and as a setting for lecturing her about not defying him by trying to find her crazed, violent brother. Coaches become another way to try and control her movements. Such mechanics of the plot are consistently motivated, whether we catch the motivation or not. The script is extraordinarily unified and tight, despite its complexity. After two viewings, I was glad to discover that I had understood the basic plot on my initial one, although many subtle points were filled in. 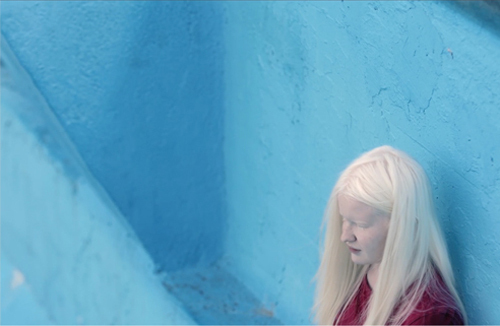 The narrative is structured through a chain of clues, which we learn only as Írisz does. Írisz is told something–initially, that she has a brother Kálmán. She tries to follow up that clue but is thwarted for a time. Eventually, wandering about or while accompanying the milliners of the shop to various celebrations of the store’s 30th anniversary, she bumps into people who provide her with new clues. Coincidental meetings and overheard conversations are rife here, but as David has pointed out, that’s how narratives work. If there’s one tradition that Sunset doesn’t belong to, it’s realism. The other tradition it doesn’t belong to, of course, is classical filmmaking. In a Hollywood film, one clue would lead the protagonist to another and that to another, building the chain that resolves the mystery. The action would move steadily, even when obstacles that thwart the protagonist must be overcome, creating suspense. In Sunset, a clue may intrigue the heroine, but she finds no way to follow up on it. There is a frustrating pause another clue crops up. The sense of progression is thus sporadic and somewhat random, rather than linear and strictly causal. The overarching ambiguities of the plot arise from the fact that Írisz frequently receives contradictory clues and is unable to decide whether Kálmán and Brill are heroes or villains. At one stage Írisz thinks her brother is a sadistic murderer, but later she begins to suspect he is a hero–and still later she again believes him to be a monster. A similar series of reversals happens with Brill. Thus we may conclude that we understand where the narrative development is headed, only to have our expectations reversed. It also takes quite a long time before we realize that the Kálmán Leiter mystery and the Brill mystery are connected, at which point we must rethink them both. In a few cases we must even infer a clue that Írisz has been given in the interval between scenes. I must admit that on first viewing I was puzzled as to how Írisz finds where a key player in past action, Fanni, lives. Seeing it again, I realized that the scene where Írisz asks Andor, a young servant at Leiter’s, where she can find Fanni ends with Andor asking eagerly, “Can you make him come back?” He’s referring to Kálmán, whom Andor secretly idolizes. A cut begins a new scene with Írisz approaching the building where she finds Fanni. When she again sees Andor in the following scene, he asks, “Did you find the girl?” Thus it is clear that Írisz told Andor she would try to bring Kálmán back, as she may intend to at this point, and that he gave her the address. It’s not easy to grasp moments like this on the fly, but it’s far from impossible. Sunset is a film awash with such delicious ambiguities, almost to the point of damaging its basic cogency at times (not least in simple geographical terms). That said, however disorientated I became while watching Sunset, I never grew frustrated. I did, however, begin to backtrack and second-guess myself just a little, which somewhat diminished the experience (and from speaking to other critics, I was not the only one). Yet the ambiguous will always face such early criticisms–just look at Mullholand Dr.–and I not only plan on seeing Sunset again; I will relish the challenge. This is exactly what great art films can do: make us relish the challenge. The film is easy to relish, given its original, systematic stylistic elements. The cinematography has been widely admired, even by those who otherwise dislike the film. 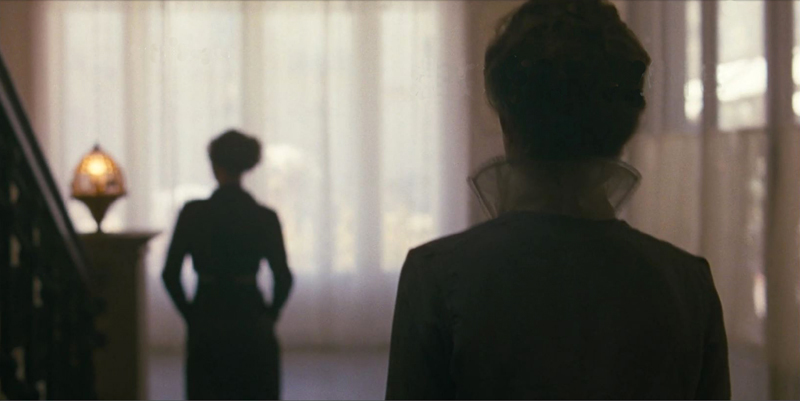 The long takes with the camera moving smoothly along with Írisz through crowded streets or circuitous interiors are virtuoso shots, justifying the use of consistently handheld camera as few films have done. 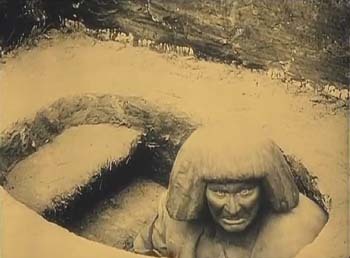 Beyond that, though, the tactic of throwing most planes of the scene out of focus is used in nearly every shot, so that we are forced intensely to concentrate on Írisz. This way we actually see even less than Irisz does, but we are not distracted from the dogged obstinacy and reckless courage of her quest. The minute control of planes of action is masterly (above and below). Throwing certain planes out of focus can become a motif (if one watches closely enough). 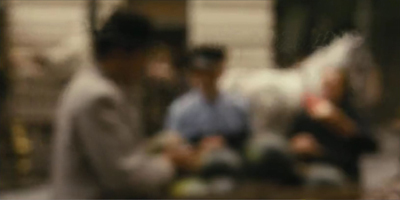 Zelma is often seen out of focus in the backgrounds of scenes. In the frame at the top of this entry, she escorts Írisz to meet with Brill in the opening scene, when Írisz is applying for a job at Leiter’s. Zelma hovers in the middle ground in the frame at the top of the this section; in the frame just above, she’s in the distance, greeting the royalty from Vienna. She is seen for the last time disappearing into a soft, distorting view (bottom of the entry), going to either a posh job attending royalty or a grim fate. As usual, we have no way of knowing which, though we may suspect. The composition hauntingly recalls the early shot of her escorting Írisz, at the top. 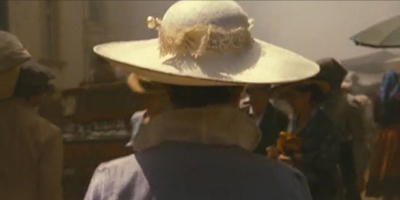 I spotted only one shot where Írisz is wholly absent, late in the film, and that is a single tracking movement in the street inserted between two scenes. Nothing is in focus. By following Írisz we may not see everything, but without her we see even less. When we finished ‘Son of Saul’ and began to talk about ‘Sunset,’ we definitely wanted to do something that was very different. 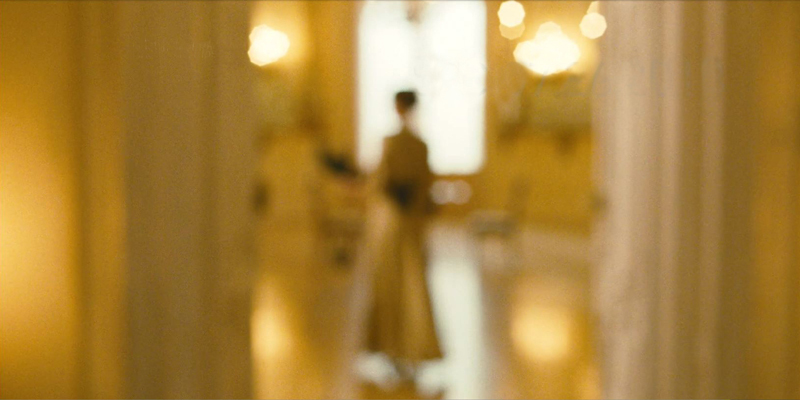 For example, if the aspect ratio was 1:1.37 in ‘Son of Saul,’ then it should be anamorphic 1:2.39 in ‘Sunset’; if ‘Son of Saul’ was to be photographed with a handheld camera, then let’s use the dolly for ‘Sunset.’ We made a mood test film, but the camera was in my hands already for the second shot. We realised that the kind of approach that László likes and that matches ‘Sunset’ requires that the camera be hand-held. We decided in advance that there would be dolly and anamorphic, however, in vain–in the end, it was 1:1.85 and a hand-held camera. 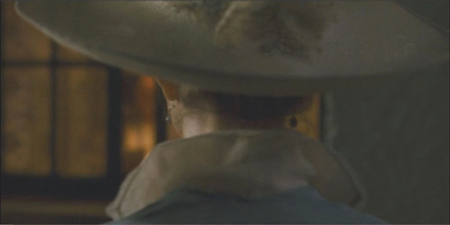 The film was shot in 35mm, with the final shot that constitutes the epilogue being set apart by filming on 65mm. Some release prints are available on film, and that’s what we saw in Venice. It was one of only two films shown on 35mm (the other being Vox Lux). See it on film if you possibly can. It’s gorgeous. The space of ‘Son of Saul’ is an enclosed universe, the strict but also intimate world of the concentration camp. ‘Sunset,’ on the other hand, takes place in an open world, with all the sounds and noises of a big city. 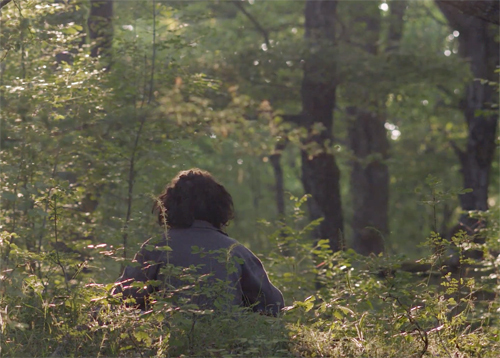 This means that in this film we–sound designer and production designer alike–had to create a completely different, open and noisy universe which reflects much less intimacy. Still, I would be hard put to figure out that layout of Leiter’s Hat Store or guess where the house where Írisz and the other milliners live is in relation to it. 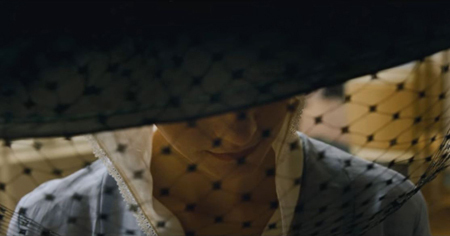 If there’s one thing that reveals the vast difference between Son of Saul and Sunset, it’s that in the former we dread to see the offscreen, out-of-focus, peripheral things that are happening. In the latter, we yearn for a view of the crowded streets of Budapest and the splendid decor of Leiter’s Hat Shop. We are frustrated, channeled into watching Írisz but having a constant sense of the city which we glimpse occasionally in focus and more frequently in an evocative haze. I look forward to relishing a third viewing. As always, thanks to Paolo Baratta, Alberto Barbera, Peter Cowie, Michela Lazzarin, and all their colleagues for their warm welcome to this year’s Biennale. Many thanks also to Michael Barker and Allison Mackie of Sony Pictures Classics for their help in preparation of this entry. My quotations come from the interviews with the filmmakers in Hungarian Film Magazine (Autumn 2018), pp. 10, 11, 16, 17, 21. Nearly all of this issue is devoted to revealing interviews with the director, star, cinematographer, set designer, costume designers, and sound designer. In Venice, this issue was provided to the press, and it is available in its entirety online here. Some photos from our Venice jaunt are on our Instagram page. As Variety‘s Nick Vivarelli pointed out earlier this week, Arab cinema is well represented here at the Venice International Film Festival. The same is true of Middle Eastern films in general. I couldn’t catch all them, but here are some thoughts on those I saw. Comedies about ethnic hostility in Ramallah are understandably rare. For a long time the only one I knew of was Elia Sulieman’s masterly Divine Intervention (2002), though there may be others. Now we have Sameh Zoabi’s Tel Aviv on Fire, a real crowd-pleaser playing in the competitive Horizons section of the festival, a section designed to showcase promising early-career filmmakers. Despite the title, which might suggest a grim tale of conflict, perhaps involving terrorism, the film is very funny. “Tel Aviv Is Burning” is the name of a daily melodramatic TV series made in Ramallah by a group of Palestinians but enjoyedby both Jewish Israelis and Palestinians–mostly women. (All citizens of Israel are considered Israeli. This means that, ironically, the Israeli Film Fund is required to provide funding to Palestinian projects; it is one of Tel Aviv on Fire’s backers.) The story arc is at a point where a Palestinian woman is assigned to disguise herself as Jewish in order to seduce an important Israeli general and get a key to a hiding place for military plans. Salam, the protagonist (played by Kais Nashif, who won the best actor award in the Horizons competition), is the lowly nephew of the show’s producer, fetching coffee and helping keep the Hebrew dialogue authentic. Suggesting a bit of action one day, he is promoted to be a writer, despite having no experience or skill. 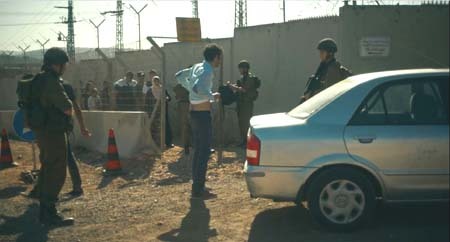 When Saam is stopped for no reason at an Israeli checkpoint (above), he meets a general, Assi. Salam boasts about being a writer on the show, which happens to be a favorite of Assi’s wife. Hoping to impressive his shrewish spouse, Assi puts pressure on Salam to slant the story: the heroine should fall in love with and marry the Israeli general she has seduced. Eager to get away, Salam agrees. The rest of the story is a cleverly scripted series of twists as Assi makes further demands to make the Israeli general more sympathetic and Salam tries to foist these on his reluctant collaborators. One might argue that the final surprise revelation does in fact make the film lean toward the Israeli side. On the whole, though, Zoabi’s film balances the two factions and manages to convey that the ongoing conflict is absurd, given the many similarities between the two main characters and the universal appeal of “Tel Aviv on Fire” across Israel’s population. Veteran Israeli filmmaker Amos Gitai contributed a program of two films to the festival. The first was a short, A Letter to a Friend in Gaza, the second the feature A Tramway in Jerusalem, both playing Out of Competition. 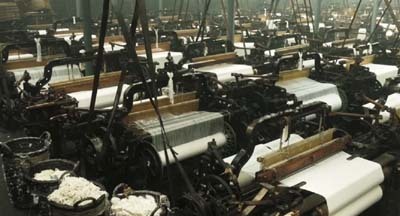 A Letter to a Friend in Gaza is a evocation of the bitter disagreement between people, even within families, using a text by Albert Camus to sum up the issues in poetic form. I suspect one would need to know a great deal about the Palestinian occupation to fully grasp this oblique work. The issues are readily apparent, however, in A Tramway in Jerusalem. 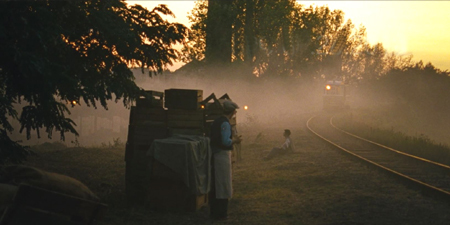 Set aboard a tram, with occasional shots on platforms where it stops, the action consists of a series of short scenes between a wide variety of citizens. The episodes are separated by titles announcing the time of day, but these skip about, suggesting that this is not a day-in-the-life-of a tram tale but a series of random encounters. 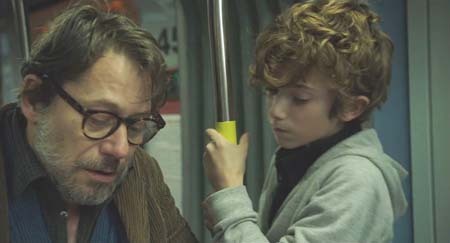 The vignettes are not connected, though a few characters recur, most notably a French tourist introducing his beloved Jerusalem to his son. The participants in these short scenes are played by actors, though the only one likely to be recognizable to a broad audience is Mathieu Amalric as the tourist (above). The scenes suggest a range of possibilities for successful or failed coexistence. For no reason but prejudice a woman accuses a Palestinian man standing next to her of sexual harrassment, and the guards on board immediately throw him to the floor. Two sophisticated young women, one Palestinian with a Dutch passport, the other an Israeli, are standing side by side. They chat casually, clearly very much alike, and when, again for no reason, an aggressive guard demands the Palestian’s passport, the Israeli stands up for her. In an overly long episode, a Catholic priest soliloquizes about the death of the three religions struggling for dominance in their mutually sacred city. The French tourist, determined to idealize Jerusalem, fails to realize that a local couple is poking fun at him by enthusiastically advocating the violent suppression of Palestinians. Not all Iranian films involve searches by any means, and yet searches, whether they involve a journey or not, provide the structure of many familiar classics like Where Is My Friend’s Home? and The Mirror. 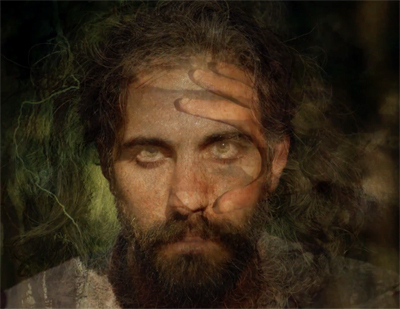 By chance, two films at this year’s festival show searches involving in one the beginning of life and in the other its end. Mostafa Sayari’s first feature, As I Lay Dying (Hamchenan ke Mimordam), also played in the Horizons competition. It begins after the death of an old man. One of his sons, Majid, who has cared for him recently, admits to the doctor that he had provided the sleeping pills that apparently killed his father, but the doctor agrees not to mention this on the death certificate. A hint that the time of death is not known provides the first clue in a subtle mystery. Further clues surface in the course of a psychological drama among the four siblings who assemble to drive their father’s body to a small, distant village for burial. As the journey continues and quarrels develop, the siblings question Majid as to why he chose this remote village for the burial. The length of time that the father has been dead emerges further as a significant factor. By the end, the answers to the three siblings’ questions becomes apparent to them. Speaking with others who had seen the film, I heard complaints that the story was difficult to understand. I think that As I Lay Dying is something of a mystery story, without being strongly signaled as such, and that sufficient clues are dropped along the way that the viewer should be able to understand the situation by the time the story ends, rather abruptly and perhaps seeming not to offer a resolution. (It would help to know that Muslim burials are supposed to take place as soon as possible, ideally within 24 hours.) Certainly nothing is made explicit at the end, though again, an attentive viewer should figure out the implied outcome. The search narrative goes back at least as early as Ebrahim Golestan’s Brick and Mirror (Khesht O Ayeneh, made 1963-64, released 1966). It was one of the historically important films shown in the “Venice Classics” series of recent restorations. Brick and Mirror is generally considered the first Iranian art film, having come out three years before Dariush Mehrjui’s classic, The Cow (1969). Golestan was an experienced filmmaker, mostly of documentaries, but Brick and Mirror was his first fiction feature. The title has nothing to do with the subject matter of the film but is more evocative, being, as Golestan has revealed, derived from a Thirteenth Century Persian poem: “What the Youth sees in the mirror, the Aged sees in the raw brick.” The word “brick” here does not refer to the familiar fired brick, which costs money to buy, but to the simple mud brick, widely used by the poor across the Middle East, since anyone with access to silt and a simple wooden frame can make them. The story begins one night as the taxi-driver protagonist, Hashem, discovers that a woman passenger has left a baby in the back seat of his car. 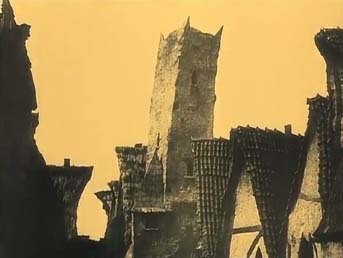 In a famous scene, he wanders the desolate neighborhood searching for her (see below). Eventually his girlfriend joins him in his apartment to help care for the child. The experience leads her to hope that they can marry and raise the child themselves, turning their so-far aimless affair into a family. The quest to find a practical, humane way to dispose of the baby–or not–takes up the rest of the film. Near the end, a lengthy scene of babies and young children in an orphanage reflects Golestan’s documentary experience. The new print recalls the rough, often dark look of black-and-white widescreen films of the 1960s, especially those of the French New Wave. Golestan’s story of fruitless wandering and unresolved relationships has been compared by some critics to the films of Antonioni, and it seems clear that Antonioni’s work and other European films of the 1950s and 1960s influenced him. There are, however, distinct differences. While Antonioni deals with the psychology of bourgeois characters (except in Il Grido), the couple in Brick and Mirror are working-class, and their problems are caused as much by their social situation as by any general ennui. Remarkably, Golestan was present to introduce the film. 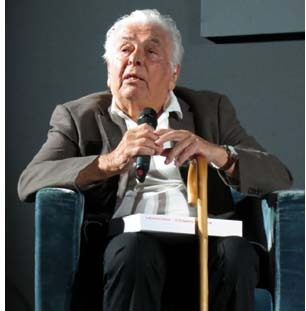 At 97, he remains articulate and charming. He primarily sketched out his early career and the inspirations for Brick and Mirror. The most interesting point concerned a startling moment during the early scene of Hashem searching the dark neighborhood for the elusive mother of the baby. A close composition of him at the top of a long stairway suddenly leads to a quick series of axial cuts, each shifting further back until he is seen in extreme long shot. The moment reveals the empty staircase and emphasizes the hopelessness of the chase. Golestan emphasized jump-cut quality of the passage and mentioned that he had not seen Breathless at the time Perhaps the moment harks back further, to the axial cuts of static figures used in Soviet films of the 1920s and the work of Kurosawa. Previously only incomplete, worn prints of Brick and Mirror were available, and then only in rare screenings. The importance of this restoration was emphasized by the festival’s publication of a short book, Brick and Mirror, which brings together a number of essays by Golestan and others. It also describes the restoration, done with the director’s cooperation and accomplished at the L’Immagine Ritrovata Laboratory in Bologna. My thanks to Ehsan Khoshbakht for providing me with a copy and more generally for his important work in reviving Iran’s film heritage, including programing the Iranian season at Bologna that I reported on in 2015. 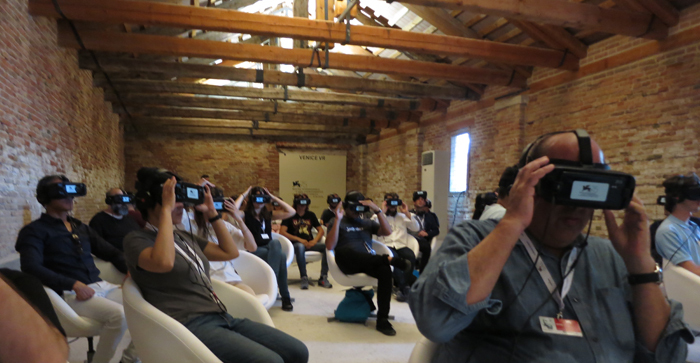 As ever, thanks to Paolo Baratta, Alberto Barbera, Peter Cowie, Michela Lazzarin, and all their colleagues for their warm welcome to this year’s Biennale. For more photos from this years Mostra, see our Instagram page.